Click on the option you think is right, the correct answer and the explanation will be immediately available to you. 1. A man starts from a point and walks 2 km towards north. He turns right and walks 3 km. Then he turns left and travels 2 km. What is the direction he is now facing? 2. Four aeroplanes of Air Force viz., A, B, C and D started for a demonstration flight towards east. After flying 50 km planes A and D flew towards right, planes B and C flew towards left. After 50 km, planes B and C flew towards their left, planes A and D flew towards their left. In which directions are the aeroplanes A, B, D, C respectively flying now? 3. If South-East becomes North, then what will South West become? 4. From her home Prema wishes to go to school. From home she goes toward North and then turns left and then turns right, and finally she turns left and reaches school. In which direction her school is situated with respect to her home? 5. 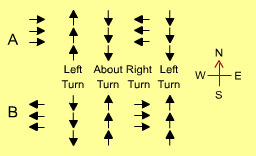 Two squads of soldiers A and B, facing East and West respectively received the following commands - Left Turn, About Turn, Right Turn, Left Turn. 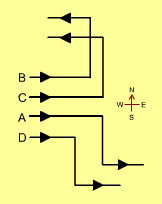 Which directions would the squads A and B face at the end? 6. A man is facing East, then he turns left and goes 10 m, then turns right and goes 5 m, then goes 5 m to the South and from there 5 m to West. In which direction is he from his original place? 7. A driver left his village and drove North for 20 kms, after which he stopped for breakfast. The he turned left and drove another 30 kms, when he stopped for lunch. After some rest, he again turned left and drove 20 kms before stopping for evening tea. Once more he turned left and drove 30 kms to reach the town where he had supper. After evening tea in which direction did he drive? 8. Raju moved to his North – West side for 2 km. From there he turned 90° clockwise and moved 2 km. 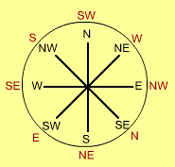 From there he turned 90° clockwise and travelled 2km then he would be in which direction from the original position? 9. Janaki started from her house and walked 2 kms towards North. Then she took a right turn and covered one kilometer. Then she took again a right turn and walked for 2 kms. In what direction is she going? 11. A man walks 6 km towards the north, then turns towards his left and walks for 4 km. He again turns left and walks for 6 km. At this point he turns to his right and walks for 6 km. How many km and in what direction is he from the starting point? 12. A rat runs 15 feet towards East and turns to right and runs 10 feet. He then turns to right and runs 9 feet, and again turns to left to run 5 feet. He once again takes a left turn and runs 12 feet and finally turns to left and runs 6 feet. What direction is the rat facing now? 13. Suresh starts from a point, walks 2 miles towards south, turns right and walks 1 ½ miles, turns left and walks ½ miles and then he turns back. What is the direction he is facing now? 14. A starts from a point and walks 5 kms north, then turns left and walks 3 kms. Then again turns left and walks 5 kms. Point out the direction in which he is going now. 15. A man starts from a point, walks 4 miles towards north and turns left and walks 6 miles, turns right and walks for 3 miles and again turns right and walks 4 miles and takes rest for 30 minutes. He gets up and walks straight 2 miles in the same direction and turns right and walks one mile. What is the direction he is facing?